The Volvo XC70 is all-new for 2008. One of the first of that new breed of vehicles called crossovers, the new model is easily the best XC70 yet. It's a great alternative to conventional sport-utility vehicles, and a more practical, rational choice than a truck-based SUV for most buyers. 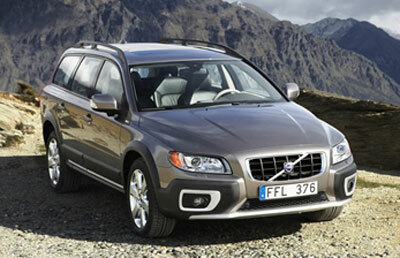 Volvo has been almost synonymous with wagon since the company began selling cars in the United States in the 1950s. In many respects the XC70 is a conventional station wagon, and closely related to the Volvo V70 (also all-new for the 2008 model year). Yet the XC70 is different. It comes standard with fulltime all-wheel-drive, and its suspension is raised to increase both movement range and ground clearance. The XC70 also features dent-resistant lower body cladding and protective skid plates underneath, as well as an electronic system called Hill Descent Control, which makes driving down steep trails easier and safer. We found the XC70 offers as much off-road capability as most sport-utility buyers will ever need. It can handle some fairly rugged backcountry trails, and it's rated to tow up to 3300 pounds, which is enough for a small boat. Its maximum cargo capacity of 72.1 cubic feet is on par with some mid-size, truck-based sport-utilities. Yet the XC70 doesn't extract a significant toll for its off-road or cargo-hauling potential. It's maneuverable and quite comfortable on paved roads, where most of us drive most of the time. It isn't the most exciting vehicle to drive, and probably not as sporty as Volvo's V70 wagon, but it makes a good grand tourer and great daily transportation. It rides smoothly and doesn't float or lean excessively through the curves, and it should deliver better real-world gas mileage than most mid- and full-size truck-based SUVs. On gravel roads and rough, unpaved roads, it handles well and is fun to drive, making it an enjoyable companion in the backcountry. Those familiar with previous XC70s will have a good handle on the new one's basic potential. Still, the 2008 model is new from the wheels up, and better than its predecessors in just about every way. It's the first XC70 with a six-cylinder engine, rather than a five-cylinder. Volvo's new 3.2-liter inline-6 generates 235 horsepower and 236 pound-feet of torque, which is on par with most engines of similar displacement. We prefer its styling. The new design is tighter and probably not as odd, though it still has the rugged, outdoorsy look many buyers embrace. Inside, the XC70 has one of Volvo's best interiors ever: very Scandinavian, and elegantly understated. More important, it's easy to master its multitude of controls, and it's simpler and more efficient than many of its European luxury competitors. The 2008 XC70 has more room inside than the 2007 model, and it comes well-equipped compared to some other vehicles in its price range. The seating arrangement is flexible and the cargo compartment has tie-downs and other useful accessories. With the rear seats folded, the XC70's flat floor and low lift-over height make loading bulky cargo easier than with many SUVs. Finally, the 2008 Volvo XC70 continues the brand's longstanding emphasis on safety. And it has more standard safety features than the previous-generation model. The essentials come standard, including advanced multi-stage, multi-compartment airbags, seats designed to limit whiplash injuries, electronic stability control and the latest anti-lock brake (ABS) technology. New safety options include a blind spot warning system, and radar-managed accident avoidance package and built-in child safety seats that adjust as children grow to optimize crash protection. The 2008 Volvo XC70 ($36,775) comes with a six-cylinder engine, a six-speed Geartronic automatic transmission, and all-wheel drive. Standard features include fabric upholstery, an eight-way power driver seat with three-position memory, dual-zone automatic climate control, 160-watt AM/FM audio with single-CD and eight speakers, a leather-wrapped tilt/telescoping steering wheel with cruise and audio controls, auto-dimming rearview mirror with compass and remote garage door opener, fog lights front and rear, a fold-flat 40/20/40 split rear seat with a locking cargo-floor storage bin and a fold-flat front passenger seat that considerably increases cargo flexibility, and 16-inch alloy wheels. Options include the Premium Package ($2,995), which includes a power glass sunroof, leather seating, a power passenger seat and walnut or walnut-root trim. The Convenience Package ($1,195) adds front and rear park assist, a humidity sensor for the climate control system, Interior Air Quality filtration system, a power tailgate, dark tint rear windows, a Grocery bag holder and 12-volt power outlet in the cargo area. The Climate Package ($875) includes heated front and rear seats, headlamp washers, heated windshield washer nozzles and Rainsensor windshield wipers. The Audio Package ($1,650) includes a 650-watt amplifier, Dolby Pro-Logic II Surround Sound processing, 12 speakers, a 6CD changer, rear-seat headphone jacks and Sirius Satellite Radio. The Volvo Navigation System ($2,120) uses DVD-based map data with driver controls on the steering wheel and remote control. The rear-seat DVD system ($1,800) adds two seven-inch LCD monitors in the front headrests, with an auxiliary jack for video games or cameras, wireless headphones and remote control. Stand-alone options include Active Bi-Xenon high intensity gas discharge headlamps ($800), metallic paint ($475), 17-inch alloy wheels ($550) and satellite radio prep ($95). Safety features that come standard include multi-stage front-impact airbags and curtain-style head protection airbags for all outboard seats. The front passenger side-impact airbags have two compartments: a lower one for the hips, which can handle more force without injury, and a second one that deploys more gently around the shoulders. Volvo's latest generation Whiplash Protection Seating System (WHIPS) is design to minimize neck and back injuries in a significant rear impact. Dynamic Stability and Traction Control (DSTC), the latest-generation anti-lock brakes (ABS) and a tire-pressure monitor are also standard. The new XC70 also offers several new safety options. Integrated child safety seats ($495) are built into the rear outboard seats, and can be adjusted specifically to the child's size. This optimizes the seatbelt geometry regardless of the child's stature. The safety belts have specially adjusted force limiters to reduce the risk of restraint injury, and the side-curtain airbags are lengthened for better coverage. Volvo's Blind Spot Information System, or BLIS (($695), is one of the original systems designed to warn the driver of approaching vehicles that might not be visible in the mirrors. Adaptive Cruise Control with Collision Mitigation by Braking ($1,495) uses the radar-managed active cruise control to warn the driver of a possible collision. The system issues a warning if the XC70 is closing quickly on an object and pre-loads the brake system, and it can actually engage the brakes if the driver fails to respond. The Volvo XC70 is all new for 2008, meaning that everything from its engine to the interior to the basic architecture if its chassis has changed. The exterior design has changed, too, and while its basic character is familiar Volvo, the XC70 looks smarter than before. And it is smarter. Its exterior dimensions have changed with everything else. The XC70 is now built on what Volvo calls its large car platform, which was introduced under the 2007 S80 sedan, while the previous XC70 shared its underpinnings with the intermediate S60 sedan. The important point is that the XC70 now has more in common with the line-topping S80 than the mid-size S60. Given that it shares a larger car's platform, it might seem odd that the 2008 XC70 is nearly a foot shorter than the 2007 model. Its wheelbase, however, increases about two inches to 110.8, which creates more room inside. A longer wheelbase combined with a shorter overall length means shorter overhangs, and that's a good thing. Overall, the 2008 XC70 is a bit shorter and narrower than a BMW 5 Series or Mercedes E-Class wagon. Yet it's slightly heavier than either, and weighs 400 pounds more than the 2007 model. No lightweight, the 2008 XC70 tips the scales at 4,092 pounds. The XC70 body is nearly identical to that of the new Volvo V70, which fills the role of a more conventional road-going wagon in the Volvo lineup. Both were developed with Volvo's attention to impact-dissipating crumple zones, and both have fully laminated glass. The only unique XC70 structural feature is an extra lower front crossbeam, added to account for its higher ride height in an impact. The new styling is Volvo evolution, but it's also smoother, less gangly and visually tighter than the 2007 XC70. In profile, the character line at the bottom of the windows rises a bit more dramatically, creating a more forward leaning, dynamic stance. The window pillars are blocked out, which makes all the windows look like a single element. The rear glass now angles forward toward the front of the car, rather than dropping cliff-like from the back edge of the roof, yet there's still there's a bit more cargo volume inside. The headlights and grille are larger, a bit more angular and more prominently defined. The XC70 now has a soft plastic nose painted to match the body, rather than the full, dark-vinyl mask worn on the 2007 version. The lower bumper is still dark vinyl, with intake-like cutouts for the foglights; below it, the silver-colored skid has been widened and shaped more aerodynamically. There's still a lot of dark, impact-resistant cladding around the bumpers and along the rockers, but we'll take the new look over the old. From the rear, the XC70's hexagonal shape reminds us of Volvo's new, small C30 coupe. The tail lights are large enough and bright enough to do Las Vegas proud, and the rear glass window extends down lower than the side windows to improve rearward visibility. The optional, hydraulically operated power tailgate is handy if you approach the back of this car with arms loaded, and it keeps hands cleaner if the tailgate is coated with grime. The XC70 interior borrows heavily from Volvo's line-topping S80 sedan, taking both design themes and components such as gauges, switches and console. We'd call it one of the company's best yet. Volvo interiors have usually been straightforward in function, but they've sometimes been almost cloddish in appearance, with at least a few quirks. Not so in this all-new XC70. It's understated, but elegant and nicely polished. Materials and overall finish are high grade. The optional leather upholstery is smooth and stretched tautly over the front seats, and the seats themselves are excellent. It's hard to find a better mix of comfort and support for typical driving. Ventilated cool seats are optional. Visibility outward is good, forward and aft. The rear-most side windows are imbedded with their own electrical grid for defrosting. With the 2008 XC70, Volvo has also refined its WHIPS whiplash limiting seat design. During a rear-end impact, the seatbacks moves rearward to reduce acceleration forces on the occupant's back and neck, while the headrest pushes forward and upward slightly to meet the neck and head as they are thrust backward. The XC70 driver sits before a fat, leather-wrapped steering wheel, looking at big, crisp gauges with bright-white backlighting and number gradients that are easy for the brain to absorb. The standard trim is etched aluminum, but the optional walnut and walnut root are gorgeous. The overall effect is very Scandinavian, yet the coolest element may be the thin-panel center stack. It's no more than two inches thick, with open space behind it. Most controls are placed here, with audio above climate and a display at the top, arranged in a neat, symmetrical pattern. The primary knobs are big and raised substantially from the surface, and the airflow controls are fashioned in an icon shaped like a seated person shaped icon, so there's absolutely no confusion about directing air toward the face, feet or windshield. It's all quite clean and pleasing. Most significantly, measured by function and simplicity of operation, the XC70's various controls are better than most other luxury brands, and particularly German brands, which still insist on layering more menus in their interfaces (while still adding more buttons). This alone might be enough reason for some to choose Volvo. The navigation system is new, and promising. The screen pops up vertically from the center of the dash, though it's canted forward at what seems a strange angle. The driver surfs through menus and makes choices with buttons on the back of the steering wheel spokes, almost where you'd expect paddle shifters for an automatic transmission. Our initial reaction is that it's better than other systems. The menus are no more difficult to learn, and they're managed without taking hands from the steering wheel and fishing for the controls. Passengers can control the system with a remote. In-cabin storage is decent. The center console and glovebox hold quite a bit of stuff. The pockets behind the front seatbacks are handy and the cupholders work well. The XC70's rear seat is not the roomiest, given the apparent size of the vehicle it's in. We wouldn't recommend it to six-footers for a cross-country trip. There's enough room that someone 5-feet, 9 inches won't get claustrophobic or cramped riding in the back of the XC70 across town, however. And we think it would be fine for families until the kids are well into their teens. With the stereo upgrade, there are redundant audio controls and headphone jacks for rear passengers. The rear DVD system puts a screen in the back of both front headrests, which we prefer to those that drop from the headliner. The all-new 2008 Volvo XC70 demonstrates both the appeal and the value of so-called crossover vehicles, which the original XC helped popularize starting in 1996. This third-generation XC70 is the best yet, but its basic character hasn't changed much, and its appeal can be distilled into one thought. There may be no better compromise between what people want in a true, truck-based sport-utility vehicle and what they need for daily transportation. The XC70 offers moderate off-pavement capability and superb gravel road handling. Yet it's also smooth, quiet and comfortable on the highway, and more maneuverable than nearly any truck you can buy. It provides good passenger-cargo flexibility and more cargo volume than some mid-sized SUVs, but its exterior dimensions are relatively compact, and it's easy to park. It can tow a camper, a fishing boat or a couple of snowmobiles, but it gets decent real world gas mileage. The 2008 XC70 is the first with a six-cylinder engine, rather than Volvo's familiar five-cylinders. Its 3.2-liter inline 6 was first used in the 2007 S80 sedan, and it generates 235 horsepower at 6200 rpm, with 236 pound-feet of torque at 3200 rpm. That's an upgrade of 27 horsepower, compared to the most powerful engine in the 2007 XC70, and the new engine uses the latest in control and materials technology, including emissions-reducing variable valve timing. It's matched to a standard six-speed automatic transmission, with one more gear than the previous model, to improve both response and fuel economy. This transverse (or sideways) mounted engine is also very compact, which helps explain why the 2008 XC70 is nearly a foot shorter than the previous model, yet offers more interior space. Volvo's new six reminds us why we like inline six-cylinder engines, or straight sixes as they're known. The just seem to power-up faster than more common V6s, spinning more freely and smoothly as they go. In a vehicle of the XC70's heft (4092 pounds), Volvo's 3.2 doesn't qualify as a screamer, but it delivers acceleration-producing torque in smooth, linear fashion and breathes well at high rpm, which means it doesn't gasp or get rough if you run it near the redline. From a stop or for passing at higher speeds, the XC70 accelerates better than adequately, and the eager quality of its engine might make you actually want to shift the six-speed automatic manually as you go about your business. No need to do so, however. Volvo's Geartronic transmission is probably its best automatic so far. It seems to shift in all the right places, and whether it's up a gear or down, those shifts are smooth, tight and relatively quick. The Geartronic manual feature can be enjoyable nonetheless, should the driver choose to get more involved. There are no paddle shifters behind the steering wheel, as many cars now feature (that's where Volvo put controls for its navigation system), but there's a manual slot for the shift lever left of the normal gear-selection path. The up-down gear change action has a smooth, quality feel, and the transmission won't insult the driver by shifting up on its own if the revs get to high. The XC70 doesn't get tiresome around town or on the open road, as some conventional sport-utilities can. It rides comfortably and quite smoothly, and despite some fairly substantial suspension travel, it's not mushy. There's none of the stiffness or racket you'll find in some truck-based SUVs, either. The XC70 leans a bit in corners when driven aggressively, and pitches some between hard acceleration and hard braking. The 2008 Volvo XC70 is all-new, and better than its predecessors in just about every way. It looks better, in our opinion, and its interior is first rate. It's quiet, maneuverable and pleasant for the sort of driving most of us do most of the time, which means carrying ourselves, our things and passengers on freeways and city streets. It also offers genuine off-pavement capability and it's very good on unpaved roads. It has lots of room for gear and the cargo compartment is perfectly flat. It offers many advantages over truck-based SUVs, including better fuel economy, better handling, better ride, and for many it's a more rational alternative. J.P. Vettraino filed this report to NewCarTestDrive.com from Germany, with Mitch McCullough reporting from northwestern Montana. Options as tested (MSPR): Premium Package ($2,995) includes power glass sunroof, leather seating, power passenger seat, walnut inlays; Convenience Package ($1,195) includes humidity sensor, interior air-filtration system, front and rear park assist, power tailgate, dark tint rear windows, grocery bag holder, 12-volt power outlet in cargo area; Climate Package ($895) with heated front and rear seats, headlight washers, heated windshield washer nozzles and Rainsensor windshield wipers; Volvo Navigation System ($2,120) with DVD-based map data and remote control; Rear-seat DVD Entertainment Package ($1,800) with two seven-inch LCD monitors, auxiliary jack for video games or cameras, wireless headphones and remote control. Head/hip/leg room, f: 37.8/54.8/41.9 in. Head/hip/leg room, r: 38.5/55.1/34.6 in. Cargo volume: 72.1 cu. ft.